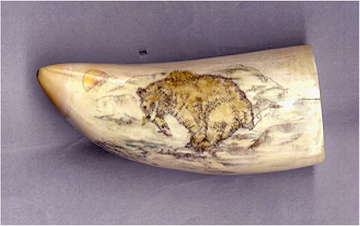 This great scrimshawed Sperm Whale's tooth is scrimshawed with the "stipple" technique on one side. In light color, it depicts a grizzly bear balancing on a rock at a stream's edge. The bear has just caught a salmon and still has it in its mouth. This horizontal tooth is signed on the back side. It is 4 5/8 inches along the convex edge, and 1 3/4 inches wide at the base. It weighs 135 grams. This is a legal tooth, registered with the U.S. Department of Commerce as #21-120. A treat, this scrimshawed Sperm Whale's tooth will make a great gift for any scrimshaw collector, or a grand addition to your own collection!